IF ONLY A 'Dirty Bomb' Attack (Not the vastly more devastating nuclear weapon blasts with fallout discussed below.) - You can expect localized and downwind contamination from the explosion and dispersed radioactive materials. If you are near enough to see or hear any local bomb blast, assume that it includes radiological or chemical agents. You should move away from the blast area as quickly as possible. If the wind is blowing toward you from the direction of the blast, travel in a direction that keeps the wind to your left or right as you move away from the blast area. If possible cover your face with a dust mask or cloth to avoid inhaling potentially radioactive dust. Upon reaching a safe location, remove your outer clothing outside and shower as soon as possible. Refer to local news sources for additional instructions about sheltering or evacuation. The government is better prepared to direct and assist the public in a 'dirty bomb' incident, unlike an actual nuclear weapon attack discussed below. THEN TAKE EFFECTIVE PROTECTIVE ACTION WITH CONFIDENCE... FAST! You must decide FIRST if you need to prepare where you are, or attempt evacuation. The nature of the threat, your prior preparations, and your confidence in your sources of information should direct your decision. If you know already you will be preparing to stay at your own home or, at least, the immediate local area, go now to #2 below. If you are considering evacuation, your decision requires a very high confidence that it is worth the risk. You do not want to get stuck between your current location and your hoped for destination, as there will probably be no easy getting back. If you fail to get to your destination, you may be exposed without shelter, in a dangerous situation with little effective law enforcement, perhaps among panicked hordes of refugees. Whatever supplies you have may be limited then to what you can carry on foot. IF you are in a big city or near a military target, AND you have relatives or friends in the country that you know are awaiting you, AND the roads between you and them are clear, AND the authorities are not yet restricting traffic, AND you have the means and fuel, evacuation may be a viable option for a limited time. DO NOT attempt evacuation if all of the above is not clearly known, or if the situation is deteriorating too quickly to make the complete trip. You do not want to get stuck and/or become a refugee being herded along with panicked masses. If evacuation is truly a viable option, do not wait - GO NOW! Do so with as many of the supplies listed on the last page as possible. Better to be two days too early in arriving than two hours too late and getting snagged mid-way, potentially exposing your family to a worse fate than having stayed where you were. Because of the very real danger of getting caught in an evacuation stampede that stalls, almost all families will be better off making the best of it wherever they currently are. Because time is of the essence, you need to first delegate and assign to different adult family members specific tasks so they can all be accomplished at the same time. Your first priorities to assure your family survival are Shelter, Water, and Food/Supplies. While some are working on the water storage and shelter at home, others need to be acquiring, as much as possible, the food and supplies. With one or more adults now heading to the stores with the list on the last page, those remaining need to begin storing water IMMEDIATELY! Lack of clean water will devastate your family much more quickly and more severely than any lack of food. Without water for both drinking and continued good sanitary practices in food preparation and for bathroom excursions (which will inevitably be much less sanitary than normal), debilitating sickness could rampage through your household with little hope of prompt medical attention. That is a highly likely but, avoidable, disaster, ONLY IF you have enough water. Every possible container needs to be filled with water RIGHT NOW! It will be very hard to have stored too much water. When the electricity/pumps go down or everybody in your community is doing the same thing, thus dropping the water pressure, that's it, what you've got is all you might be getting for a very long time. If you have any kiddie pools or old water beds, pull them out and fill them up, too. (Water from a water bed should be used only for bathing or cleaning, not for drinking as it may contain traces of algicide and/or fungicides.) Anything and everything that'll hold water needs to be filled up quickly RIGHT NOW!! One of the shopping items listed on the last page is new garbage cans and liner bags which you'll also use for storing water. If you can't get any more new cans, you could clean out an existing garbage can and scrub it throughout with bleach, then put in a new garbage bag liner and fill it with water. (Use two liners if they are very thin/flimsy.) Choose well where you fill up garbage cans with water because they won't easily be moved once full and many of them together could be too heavy for some upper floor locations. Ideally, they need to be very near where your shelter will be constructed and can actually add to its shielding properties, as you'll see below. BE ASSURED, YOU CANNOT STORE AND HAVE TOO MUCH WATER! Do not hesitate, fill up every possible container, RIGHT NOW! Radioactive fallout is the particulate matter (dust) produced by a nuclear explosion and carried high up into the air by the mushroom cloud. It drifts on the wind and most of it settles back to earth downwind of the explosion. The heaviest, most dangerous, and most noticeable fallout, will 'fall out' first close to ground zero. It may begin arriving minutes after an explosion. While the smaller and lighter dust-like particles will typically be arriving hours later, as they drift much farther downwind, often for hundreds of miles. As it settles, whether you can see it or not, fallout will accumulate and blow around everywhere just like dust or light snow does on the ground and roofs. Wind and rain can concentrate the fallout into localized 'hot spots' of much more intense radiation with no visible indication of its presence. Radioactive fallout from a nuclear explosion, though very dangerous initially, loses its intensity quickly because it is giving off so much energy. For example, fallout emitting gamma ray radiation at a rate of 500 R/hr (fatal with one hour of exposure) shortly after an explosion, weakens to only 1/10th as strong 7 hours later. Two days later, it's only 1/100th as strong, or as deadly, as it was initially. What stops radiation, and thus shields your family, is simply putting mass between them and the radiation source. Like police body armor stopping bullets, mass stops (absorbs) radiation. The thicker the mass, the more radiation it stops. Also, the denser (heavier) the mass used, the more effective it is with every inch more you add to your fallout shelter. The thickness in inches needed to cut the radiation down to only 1/10th of its initial intensity for different common materials is: Steel 3.3", concrete 11", earth 16", water 24", wood 38", etc. The thickness required to stop 99% of the radiation is: 5" of steel, 16" of solid brick or hollow concrete blocks filled with mortar or sand, 2 feet of packed earth or 3 feet if loose, 3 feet of water. You may not have enough steel available, but anything you do have will have mass and can be used to add to your shielding - it just takes more thickness of lighter wood, for example, than heavier earth, to absorb and stop the same amount of radiation. Increasing the distance between your family and the radiation outside also reduces the radiation intensity. To make the shelter tolerable to stay in while the radiation subsides with every passing hour While a fallout shelter can be built anywhere, you should see what your best options are at home or nearby. Some structures already provide significant shielding or partial shielding that can be enhanced for adequate protection. If you do not have a basement available, you can still use the techniques shown below in any above ground structure, but you'll need to use more mass to achieve the same level of shielding. You may consider using other solid structures nearby, especially those with below ground spaces, such as commercial buildings, schools, churches, below ground parking garages, large and long culverts, tunnels, etc.. Some of these may require permissions and/or the acquiring of additional materials to minimize any fallout drifting or blowing into them, if open ended. Buildings with a half-dozen or more floors, where there is not a concern of blast damage, may provide good radiation protection in the center of the middle floors. This is because of both the distance and the shielding the multiple floors provide from the fallout on the ground and roof. If you have a basement in your home, or at a nearby relatives' or friends' house that you can use, your best option is probably to fortify and use it, unless you have ready access to a better/deeper structure nearby. For an expedient last-minute basement shelter, push a heavy table that you can get under into the corner that has the soil highest on the outside. The ground level outside ideally needs to be above the top of the inside shelter. If no heavy table is available, you can take internal doors off their hinges and lay them on supports to create your 'table'. Then pile any available mass on and around it such as books, wood, cordwood, bricks, sandbags, heavy furniture, full file cabinets, full water containers, your food stocks, and boxes and pillow cases full of anything heavy, like earth. Everything you could pile up and around it has mass that will help absorb and stop more radiation from penetrating inside - the heavier the better. However, be sure to reinforce your table and supports so you do not overload it and risk collapse. Leave a small crawl-through entrance and more mass there that can be easily pulled in after you to seal it up. Have at least two gaps or 4-6" square air spaces, one high at one end and one low at the other. Use more if crowded and/or hotter climate. A small piece of cardboard can help fan fresh air in if the natural rising warmer air convection current needs an assist moving the air along. This incoming air won't need to be filtered if the basement has been reasonably sealed up, however any windows or other openings will require some solid mass coverage to assure they stay sealed and to provide additional shielding protection for the basement. More details on this in the next (#6) section. It's really not so difficult to build an effective family fallout shelter, not to get it done... RIGHT NOW! Government information and guidance is a vital resource in your response to a nuclear crisis, but for many reasons it may be late, incomplete, misleading or simply in error. While evacuation might be prudent for individuals who act quickly in response to a threat, governments will be slow to call for mass evacuations because of their potential for panic and gridlock. As the recent government calls for duct tape and plastic sheeting led to sold-out stores, anxiety, and derision from the press, there will be great reluctance to issue similar alarms. If you want to assure that you have adequate food and supplies for your family you must act BEFORE the panic without first waiting for government instructions that may never come or as urgently as warranted. You alone are ultimately responsible for your family. Filtering the air coming into your basement shelter won't be required. Air does not become radioactive, and if your basement is reasonably snug, there won't be any wind blowing through it to carry the radioactive fallout dust inside. Simply sealing any basement windows and other openings prevents significant fallout from getting inside. To improve both the radiation shielding inside the basement, and to protect the windows from being broken and letting fallout blow in later, you should cover them all with wood, and then with sandbags or solid masonry blocks or earth, etc. on the outside and inside too, if possible. If the basement air gets seriously stale later on, you could re-open a door into the upper floors of the still closed house, or secure a common furnace air filter over an outside air opening leading into your basement. Regarding fallout contamination, any food or water stored in sealed containers, that can later have any fallout dust brushed or rinsed off the outside of the container, will then be safe to use. As long as the fallout dust does not get inside the container, then whatever radiation penetrated the food/water container from the outside does not harm the contents. If you suspect that your clothes have fallout on them, remove your outer clothing before you come inside and leave them outside. A cheap plastic hooded rain poncho that can be easily rinsed off or left outside is very worthwhile. Have water and baby shampoo near the entrance (hose and containers) to wash and thoroughly rinse any exposed skin and hair. 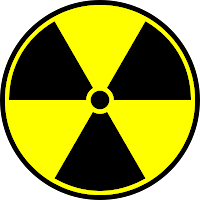 Exposure to fallout radiation does not make you radioactive, but you need to assure that you don't bring any inside. If any are stricken with radiation sickness, typically nausea, it is when mild (<100 Rads) 100% recoverable and cannot be passed on to others. Before fallout arrives, you might also try to cover up items you want to protect outside for easier rinsing off of the fallout dust later when it's safe to come out and do so. For instance, if you have a vegetable gardening spot, you might try covering much of it with plastic or tarp and weighting them down. If without sufficient time to acquire radiological instruments of your own, like Geiger counters and dosimeters, you'll need to be extra sure that your portable radios function properly from inside your shelter and that you have plenty of fresh batteries stocked for them. Without radiological instruments, listening for official guidance about the radiation threat levels in your particular area will be the only way you'll know when it's becoming safe to venture out. It might also be the only way you'll know when you first need to take your initial maximum protective action. When not in use, they should not be attached to any outside antenna or even have their own antenna extended. And, they should be wrapped in any non-conducting insulation, like layers of paper or bubblewrap plastic and then stored in a metal container or wrapped in aluminum foil to minimize the potential of EMP ruining the electronics. Having back-up radios would be very prudent. With extra radios, you can have one always tuned to the closest likely target city and, if it suddenly goes off the air, that could be your first indication of an attack. If close to a target, your first indication of a nuclear detonation may be with its characteristic blinding bright flash. The first effects you may have to deal with before radioactive fallout arrives, depending on your proximity to it, are blast and thermal energy. Promptly employing the old "Duck & Cover" strategy will save many from avoidable flying debris injuries and minimize thermal burns. Those very close will experience tornado strength winds and should quickly dive behind any solid object or into any available depression, culvert, basement, etc. A 500 kiloton blast, 2.2 miles away, will arrive about 8 seconds after the detonation flash with about a 295 mph wind blast that lasts about three seconds. An even larger 1 MT (megaton) blast, 5 miles away, will arrive in about 20 seconds. Hopefully, you are not near any target area 'ground zero' and will only, like the vast majority, have to deal with just the fallout later. When fallout is first anticipated, even though it has not yet arrived, have anybody still outside begin wearing their dust protector filter masks and hooded rain ponchos. Everyone should begin taking their Potassium Iodide (KI) or Potassium Iodate (KIO3) tablets for thyroid protection against cancer causing radioactive iodine, a major product of nuclear weapons explosions. If no tablets available, you can topically (on the skin) apply an iodine solution, like tincture of iodine or Betadine, for a similar protective effect. (WARNING: Iodine solutions are NEVER to be ingested or swallowed.) For adults, paint 8 ml of a 2 percent tincture of Iodine on the abdomen or forearm each day, ideally at least 2 hours prior to possible exposure. For children 3 to 18, but under 150 pounds, only half that amount painted on daily, or 4 ml. For children under 3 but older than a month, half again, or 2 ml. For newborns to 1 month old, half it again, or just 1 ml. (One measuring teaspoon is about 5 ml, if you don't have a medicine dropper graduated in ml.) If your iodine is stronger than 2%, reduce the dosage accordingly. Absorption through the skin is not as reliable a dosing method as using the tablets, but tests show that it will still be very effective for most. Do not use if allergic to iodine. If at all possible, inquire of your doctor NOW if there is any reason why anybody in your household should not use KI or KIO3 tablets, or iodine solutions on their skin, in a future nuclear emergency, just to be sure. When you know that the time to take protective action is approaching, turn off all the utilities into the house, check that everything is sealed up and locked down, and head for the shelter. You should also check that you have near your shelter additional tools, crow bars, and car jacks for digging out later, if required. Also, any building supplies, tools, sheet plastic, staple guns, etc. for plugging any holes from damage. Your basement should already be very well sealed against fallout drifting inside. Now, you'll need to seal around the last door you use to enter with duct tape all around the edges, especially if it's a direct to the outside door. For lighting needs within the shelter have many small LED flashlights or LED head-lamps to stretch your battery life. Try not to have to use candles if at all possible. Bring in some books for yourself and games for the children. Maybe throw in a small/thin mattress, some cushions, blankets, pillows, etc. Toilet use will be via the 5 gallon bucket with a seat borrowed from one of the house bathrooms, if you did not purchase a separate one. Garbage bag liners, hopefully sized for it, should always be used and a full-size and bag lined garbage can should be positioned very close to the shelter entrance for depositing these in when it is safe to do so quickly. Hanging a sheet or blanket will help provide a little privacy as shelter occupants 'take their turn'. The toilet needs to have its new 'deposits' sealed up tight with the plastic liner after each use. Use a very secure top on the bucket and position it near the wall with the outgoing upper air vent. Pets, and what to do about them, is a tough call. Letting dogs run free is not a humane option, both for their potential to die a miserable death from radiation exposure outside and/or to be a danger to others, especially if they get diseased and/or run in the inevitable packs of multitudes of other abandoned pets. Caring for them is ideal, if truly realistic and not a drain on limited resources, while 'putting them down' might eventually become a painful, but necessary reality. Boiling or bleach water treatments will be used for cleaning your stored water later for drinking. (This is for killing bacteria, not for radiation contamination, which is never a concern for any stored and covered water containers or even sealed food.) Tap water recently put into clean containers won't likely need to be purified before using. To purify questionable water, bring it to a roiling boil and keep it there for 10 minutes at least. If you don't have the fuel to boil it, you can kill the bacteria by mixing in a good quality household bleach at the rate of 10 drops per gallon, and letting it sit for at least 1/2 an hour. The bleach should be at least 5.25% pure, like Clorox, but be sure it has no additives such as soap or fragrance. You can later get rid of the flat taste from boiling, or some of the chlorine taste when using bleach, by pouring it from one container to another several times. BOTTOM LINE: When the TV or radio program switches abruptly to an terse announcement saying: "We Interrupt This Program For This Special Bulletin! ", and your kids look up to you with questioning wide-eyes and eager for assurances, know then that you are confidently ready for them with your own Plan of Action ready to go! That's what this is all about... our children! This guide was purposely designed with the sober realization that the overwhelming majority of our fellow Americans would not be compelled to read such a guide until a nuclear crisis was imminent and, unfortunately, their preparation options and time to prepare then would be very limited. At www.ki4u.com/who.htm we know that, at that time, we will again be quickly sold-out, as we were after 9/11, both by the public and the Federal govt., and that this guide then will be the best/only help that we can offer. If you are fortunate enough to be exploring your family preparation needs and options before such a future national crisis, there is much more that you can and should do now to insure that they are even better prepared. If stores are still at all stocked, and safe to go to, try to buy as many of the following items as possible... IMMEDIATELY! There are no quantities listed here on the food items below as family size varies and because, as the emergency and panic widens, many items will become quickly sold-out or quantities restricted and you'll need to try to get more of what does remain on the shelves. At a minimum you should be looking at two weeks of provisions, but much better to be aiming for two months or more. The reality is, if/when we get nuked, it will be a very long time before anything is ever 'normal' again, especially at any grocery stores. Florida hurricane victims can attest to the prolonged misery and disruptions from even a localized disaster, even with the rest of the country still able to help out. Nobody can begin to imagine how bad the suffering will be, and for how long, if nukes have gone off... and in multiple locations! Canned goods (pasta, soups, chili, vegetables, fruit, tuna, meats, lots of peanut butter, etc.) Ready-to-eat foods (pop-tarts, raisins, cheese, granola/energy/protein bars, snack-paks, etc.) Some perishable foods (breads and fruits like bananas, apples, oranges, grapes, etc.) Assorted drink mix flavorings (with no cold drinks, just plain water, kids will appreciate it!) Plenty of potent Multi-Vitamins, Vit C, etc. Iodine solution, like Betadine (16 ounces)- NOT TO BE INGESTED OR SWALLOWED! Paper or plastic plates/bowls/cups/utensils Quality manual can opener, 2 if you don't already have one at home Kitchen matches and disposable lighters New garbage cans and lots of liner bags (water storage & waste storage) 5 gallon bucket and smaller garbage bags sized for it (toilet) Toilet seat for the bucket (or use one from inside the house) Toilet paper and, if needed, sanitary napkins, diapers Baby wipes (saves water for personal hygiene use) Flashlights (ideally LED) and more than one portable radio Plenty more batteries, at least three sets, for each of the above Bleach (5.25%, without fragrance or soap additives) Alcohol and Hydrogen Peroxide Aspirin/Tylenol/Motrin, Pepto Bismol, etc. Prescription drugs filled, and as much extra as possible First aid kits Fire extinguishers Plenty of dust mask filter protectors Cheap plastic hooded rain ponchos for everyone Water filters and all other camping type supplies, such as Coleman cook stove and fuel, ammo, etc., if any sporting goods stocks still available. And, of course, rolls of plastic sheeting, duct tape, staple guns, staples, etc.